In maintenance hemodialysis (MHD) patients, hepatitis C virus (HCV) infection is common and may be associated with poor clinical outcomes. It was hypothesized that HCV infection would be associated with high all-cause and cardiovascular mortality in these patients after controlling for demographic and clinical characteristics, including surrogates of malnutrition-inflammation complex syndrome. A national database of 13,664 MHD patients who underwent HCV antibody serology testing at least once during a 3-yr interval (July 2001 through June 2004) was analyzed. Measurements included third-generation HCV enzyme immunoassay and routine laboratory measurements. The HCV enzyme immunoassay was reported positive in 1590 (12%) patients. In logistic regression models that included case mix and available surrogates of malnutrition-inflammation complex syndrome, HCV infection was associated with younger age, male gender, black race, Hispanic ethnicity, Medicaid insurance, longer dialysis vintage (duration), unmarried status, HIV infection, and smoking history. In proportional-hazards regressions, the mortality hazard ratio that was associated with HCV infection was 1.25 (95% confidence interval 1.12 to 1.39; P < 0.001). Mortality hazards were higher among incident (dialysis duration <6 mo) than prevalent HD patients. Subgroup analyses indicated that HCV was associated with higher all-cause and cardiovascular mortality across almost all clinical, demographic, and laboratory groups of patients. Hence, in MHD patients, HCV infection exhibits distinct demographic, clinical, and laboratory patterns, including associations with higher dialysis treatment vintage, and is associated with higher mortality. More diligent efforts to prevent and treat HCV infection may improve outcomes in MHD patients. Hepatitis C virus (HCV) infection is the most common cause of chronic liver disease in the world (1). Certain populations, including maintenance hemodialysis (MHD) patients, have a significantly higher prevalence of HCV infection, ranging from 5 to 25% or even higher, according to the recent literature (2–5). This population may serve as an exceptional model to study the impact of HCV infection on outcomes, especially because the short-term death risk is extremely high in MHD patients in the United States, at least 20% annually (6). Several investigations have suggested that HCV infection is associated with higher mortality in this population (7–12), but these studies have been limited in size and selectivity, the largest comprising only 367 HCV-infected patients (11). Given that HCV-associated liver disease typically takes decades to become clinically manifest, a period of time much longer than the lifespan of most dialysis patients with a 5-yr survival of 60 to 70% (6), the liver disease–related complications seem the unlikely link to the high death risk. Approximately half of all deaths in MHD patients are attributed to cardiovascular disease (13). To date, associations between traditional cardiovascular risk factors and death have not been observed in MHD patients (14,15), but a strong association between elements of the malnutrition-inflammation complex (or cachexia) syndrome (MICS) and poor clinical outcome has been observed (16). Because HCV infection is associated with increases in inflammatory markers and alterations in nutritional status in both the general population (17–19) and dialysis patients (20) and is related to poor survival in MHD patients, examining associations between HCV infection and death risk after adjustment for markers of MICS may better reveal the mechanisms that lead to mortality that is associated with HCV infection. Moreover, a larger study population allows more detailed examination of diverse subgroups and potential interactions. We studied a large national database of MHD patients in the United States to examine the hypothesis that HCV antibody–positive MHD patients have a higher risk for all-cause and cardiovascular mortality. We also examined whether HCV-infected MHD patients have distinct demographic, clinical, and laboratory characteristics that can be used to screen for HCV infection. Data from all individuals who had ESRD and underwent MHD treatment from July 2001 to June 2004 in one of the 580 outpatient dialysis facilities of a large dialysis organization (DaVita, Inc.) in the United States were extracted and examined. The study was approved by the institutional review committees of both Los Angeles Biomedical Research Institute at Harbor-UCLA and DaVita Clinical Research, and the requirement for written consent form for individually identifiable data was waived on he basis of the Standards for Privacy of Individually Identifiable Health Information (21). For minimization of measurement variability, all repeated measures for each patient during any given calendar quarter (i.e., during a 13-wk interval) were averaged, and the summary estimate was used in all models. Hence, average values were obtained for up to 12 calendar quarters (q1 through q12) for each laboratory and clinical measure for each patient during the 3-yr cohort period. MHD status was defined as HD treatment during at least 45 consecutive days. Dialysis vintage was defined as the duration of time between the first day of dialysis treatment and the first day that the patient entered the cohort. For preexisting (prevalent) MHD patients (i.e., dialysis vintage ≥6 mo), data from the first calendar quarter (July through September 2001) were used. For new (incident) patients (i.e., dialysis vintage <6 mo), the baseline values originated from the calendar quarter in which the patient had undergone MHD for at least 45 d at the start of the given calendar quarter. Thirteen-week averaged postdialysis weight and baseline height were used to calculate the body mass index (BMI; weight [kg]/height squared [m2]). The dosage of administered recombinant human erythropoietin (rHuEPO; EPOGEN; Amgen, Thousand Oaks, CA) was also calculated for each calendar quarter (22–24). Causes of death, reflecting the reported information in the Cause of Death form (Form 2746 for reporting to the US Renal Data System [USRDS]), were obtained. Cardiovascular death was defined as death as a result of myocardial infarction, cardiac arrest, heart failure, cerebrovascular accident, and other cardiac causes. Infectious death was defined as death attributed to an infectious disease as the primary cause of death. In addition to the presence or absence of diabetes, which was available a priori in the database, histories of tobacco smoking and preexisting comorbid conditions were obtained by linking the DaVita database to the Medical Evidence Form 2728 of the USRDS (25) and categorized into 10 comorbid conditions: (1) Ischemic heart disease, (2) congestive heart failure, (3) status post cardiac arrest, (4) status post myocardial infarction, (5) pericarditis, (6) cardiac dysrhythmia, (7) cerebrovascular events, (8) peripheral vascular disease, (9) chronic obstructive pulmonary disease, and (10) cancer. Blood samples were drawn using uniform techniques in all of the DaVita dialysis clinics and were transported to the DaVita Laboratory in Deland, FL, typically within 24 h. All laboratory values were measured by automated and standardized methods in the DaVita Laboratory. Most laboratory values, including complete blood cell counts and hemoglobin and serum levels of urea nitrogen, creatinine, albumin, calcium, phosphorus, bicarbonate, and total iron-binding capacity (TIBC), were measured monthly. Serum ferritin was measured quarterly. Hemoglobin was measured weekly to biweekly in most patients. Kt/V was used to estimate dialysis dosage, and normalized protein equivalent of total nitrogen appearance, also known as normalized protein catabolic rate, an estimation of daily protein intake, was measured monthly as a measure of protein intake. Most blood samples were collected before dialysis with the exception of the postdialysis serum urea nitrogen, which was obtained to calculate urea kinetics. The HCV antibody status was examined using the third generation of the HCV enzyme immunoassay (EIA version 2.0; Abbott Laboratories, Abbott Park, IL). An unadjusted model that included mortality data, HCV antibody result (positive versus negative), and entry calendar quarter (q1 through q12). Case mix–adjusted models that included all in 1 plus age, gender, race, and ethnicity (African American and other self-categorized black, non-Hispanic white, Asian, Hispanic, and other), diabetes and 10 preexisting comorbid states, history of tobacco smoking, categories of dialysis vintage (<6 mo, 6 mo to 2 yr, 2 to 5 yr, and ≥5 yr), primary insurance (Medicare, Medicaid, private, and other), marital status (married, single, divorced, widowed, and other or unknown), the standardized mortality ratio of the dialysis clinic during entry quarter, dialysis dosage as indicated by Kt/V (single pool), presence or absence of a dialysis catheter, and residual renal function during the entry quarter (i.e., urinary urea clearance). MICS-adjusted models, which included all of the covariates in the case-mix model as well as 13 surrogates of nutritional status and inflammation, including BMI, the average dosage of rHuEPO, and 11 laboratory variables as surrogates of the nutritional state or inflammation, together also known as MICS, with known association with clinical outcomes in MHD patients (26–28): (1) Normalized protein equivalent of total nitrogen appearance as an indicator of daily protein intake, (2) serum albumin, (3) serum TIBC, (4) serum ferritin, (5) serum creatinine, (6) serum phosphorus, (7) serum calcium, (8) serum bicarbonate, (9) peripheral white blood cell count, (10) lymphocyte percentage, and (11) hemoglobin. Missing covariate data (<2% for most laboratory and demographic variables and <18% for the 10 comorbid conditions) were imputed by the mean or median of the existing values as appropriate. All descriptive and multivariate statistics were carried out with SAS (version 9.1; SAS Institute, Cary, NC) and Stata (version 9.0; Stata Corp., College Station, TX). Because hepatitis serology tests are usually performed before a patient is accepted to an outpatient dialysis clinic for maintenance dialysis treatment, many patients with a previously documented HCV EIA result in outside facilities did not undergo repeat HCV EIA test in DaVita dialysis clinics. In this study, we examined only HCV EIA tests that were performed in the DaVita Laboratory after a patient was admitted for MHD and only patients who remained under MHD treatment for at least 45 d. The original 3-yr (July 2001 through June 2004) national database of all DaVita patients included 82,933 individuals (source population) who had undergone MHD treatment for at least 45 d including 37,049 (45%) patients from the first calendar quarter and the rest from the subsequent 11 quarters. During each of the 12 calendar quarters, the presence of HCV antibody was examined in 4 to 9% of all MHD patients of the given calendar quarter using the EIA test in the DaVita Laboratory. Cumulatively, in 13,664 MHD patients, or 16% of all DaVita MHD patients, including 5828 (42%) from the first cohort quarter, at least one HCV EIA test was performed. Among these HCV-tested patients, 1590 (12%) MHD patients had at least one positive HCV EIA test, including 48 patients with discordant results (i.e., at least one positive and one negative results). The remaining 12,074 MHD patients had concordant HCV antibody–negative results. Between 2001 and 2004, the annual prevalence of HCV EIA positivity among MHD patients whose HCV test was performed in DaVita Laboratory showed only small variations: 12.2% in 2001, 11.4% in 2002, 11.5% in 2003, and 11.1% in 2004. Table 1 shows baseline demographic, clinical, and laboratory characteristics of the studied MHD patients during the baseline calendar quarter of the cohort. HCV-positive patients were on average 7 yr younger and more likely to be men than either the HCV-negative or the entire cohort population. Black patients composed 53% of all HCV-positive patients while constituting only slightly less than one third of HCV-negative patients. The prevalence of Medicaid insurance status among HCV-positive patients was 70% higher than in other groups. Diabetes and cardiovascular diseases were less prevalent in HCV-infected patients, but death as a result of cardiovascular disease was only slightly less so. History of smoking and of HIV disease was at least twice as common in HCV-infected patients compared with other patients. Among laboratory parameters, serum albumin was slightly lower but TIBC and creatinine were higher in HCV-positive patients compared with HCV-negative patients. Serum levels of three routinely measured liver enzymes (aspartate aminotransferase [AST], lactate dehydrogenase, and alkaline phosphatase) were higher in HCV-infected patients, with AST almost twice as high in HCV-positive patients as in HCV-negative patients. Nevertheless the mean value in HCV-positive patients was 29 IU/L, which is still within the “normal” range of most commercial assays. With the use of logistic regressions, the association between demographic, clinical, and laboratory characteristics and HCV positivity was examined among all 13,664 MHD patients who had documented HCV EIA test results (Table 2). Younger age (<65 yr), single marital status, black race, history of HIV disease, and tobacco smoking each were associated with at least two times higher odds of HCV positivity. Among laboratory measures, serum AST was the strongest predictor of HCV infection. Because the longer dialysis vintage could be associated with HCV infection, additional analysis of vintage were conducted. The relative prevalence for the logarithm of vintage (in dialysis months) was 1.36 (95% confidence interval 1.28 to 1.43; P < 0.001). Upon further categorization of the dialysis vintage into seven groups (<3 mo, >10 yr, and five groups in between) and using the 3- to 6-mo group as the reference, higher vintage groups >6 mo were incrementally associated with higher prevalence of HCV infection across increasing vintage categories (Figure 1). Association between time on dialysis (vintage) and hepatitis C virus (HCV) infection prevalence in 13,664 maintenance hemodialysis (MHD) patients during 3 yr (July 2001 through June 2004). Among 13,664 HCV-tested patients, 5659 (41%) survived until the end of the cohort (June 30, 2004) or up to 1095 d; 3584 (26%) died; 934 (7%) underwent renal transplantation; and 3487 (26%) were censored as a result of transfer to a non–DaVita facility, relocation, discontinuation of MHD, and other losses to follow-up. The HCV-tested cohort included 23,390 patient-years, including 2814 patient-years for HCV-positive and 20,576 patient-years for HCV-negative patients with median cohort time of 638 and 619 d, respectively; 3130 (25.9%) HCV-negative and 454 (28.6%) HCV-positive patients died during the 3-yr cohort. Table 3 shows the unadjusted (crude) death rates among incident and prevalent HCV-positive and HCV-negative patients during the first 1000 d of the MHD cohort. The unadjusted mortality ratio among incident patients was incrementally increased from 1.15 to 1.84 over time. Table 4 shows the all-cause mortality hazard ratios associated with HCV infection from three multivariate adjustment levels using Cox proportional hazards regression. HCV infection was more strongly associated with death in incident patients (vintage <6 mo) than in prevalent patients (vintage ≥6 mo). Figure 2 compares cumulative proportion of surviving incident and prevalent patients according to HCV status during the 3-yr cohort, adjusted for age, gender, race, and diabetes. A stronger association between HCV infection and mortality was observed in incident patients compared with prevalent patients. Figure 3 shows hazard ratios of all-cause and cardiovascular death in various subgroups of MHD patients. All-cause and cardiovascular death hazards are similar, although confidence intervals are wider for cardiovascular hazards as a result of smaller death numbers. Kaplan-Meier cumulative proportion of surviving patients for all-cause mortality according to HCV antibody positivity in MHD patients during 3 yr adjusted for age, gender, race, and diabetes. (Top) All patients (n = 13,664). 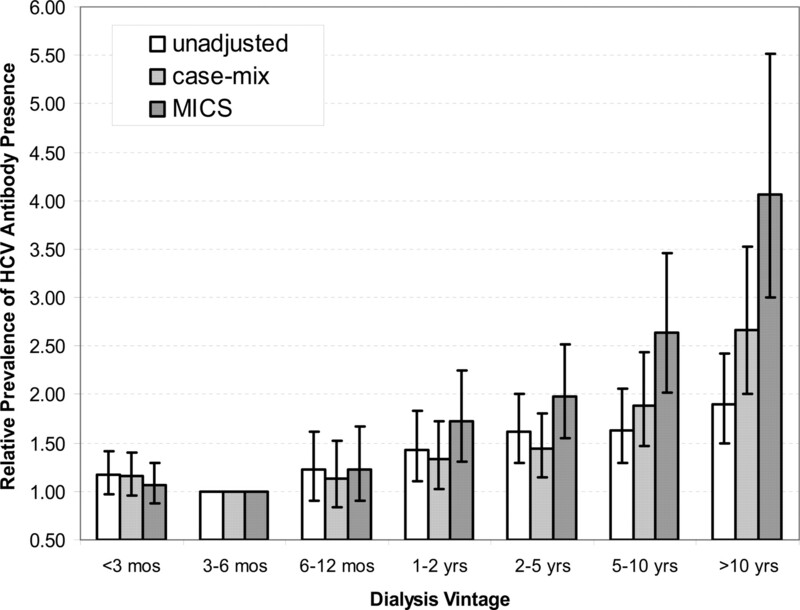 (Middle) Incident patients with a dialysis vintage <6 mo (n = 5129). (Bottom) Prevalent patients with a dialysis vintage ≥6 mo (n = 8535). Adjusted mortalities are lower than the unadjusted mortalities, and the y axis depicts only the upper portion of the entire range of survival percentage. Hazard ratio of death associated with HCV infection in various subgroups of 13,664 dialysis patients during 3 yr. (Left) All-cause mortality. (Right) Cardiovascular mortality. In 13,664 MHD patients who underwent the HCV EIA test and whose outcomes were observed over 3 yr, 12% showed a positive HCV antibody at least once. In logistic regressions that adjusted for demographic and clinical characteristics and available surrogates of malnutrition and inflammation, predictors of HCV included younger age, male gender, black race, Hispanic ethnicity, Medicaid insurance, unmarried status, HIV positivity, and smoking history. The longer an MHD patient underwent HD since the start of dialysis treatment, the higher was the prevalence of HCV infection. HCV infection was associated with both all-cause and cardiovascular mortality among MHD patients. This association was stronger in incident than in prevalent MHD patients, which may underscore the effect of survival bias in the prevalent MHD patient cohort, many members of which had died before the start of the study. The association between HCV infection and mortality seemed consistent among various subgroups of MHD patients and independent of cause of death. HCV infection is much more common among MHD patients compared with the general population (2–4). Even though the prevalence of positive HCV serology is said to be decreasing to levels of the predialysis patient population, (8) this study indicates a prevalence of 12% among those whose HCV antibody status was screened in one laboratory via the EIA during the 2001 to 2004 period. Although a selection bias might exist in choosing MHD patients for the HCV screening, we believe that most patients who never had any HCV EIA tests are most likely those who had a negative HCV test result at baseline performed in a non–DaVita facility or before the intercept of the 3-yr cohort. Our foregoing assertion is supported by the finding that most demographic, clinical, and laboratory features, including liver enzymes, were very similar among the 12,074 HCV antibody–negative patients and the rest of the 69,294 patient cohort who did not have a documented HCV EIA test (Table 1). The striking discrepancy in prevalence of HCV infection between MHD patients and the general population may not be necessarily related to the renal disease, because HCV infection seems more common in MHD patients compared with those who undergo peritoneal dialysis, a renal replacement therapy with less blood exposure (2). Other studies have indicated increasing prevalence of HCV infection with greater duration of MHD treatment (2,5,12) and continuing incidence of new HCV infections in MHD patients (29), suggesting that infection control efforts in dialysis centers may be insufficient. Consistent with the latter findings, our study also showed that dialysis treatment vintage was associated with higher HCV infection prevalence (see Figure 1). Although this may be related to more cumulative risk of exposure to infectious sources over time, the possibility of a cohort effect should also be considered (i.e., patients whose dialysis treatment started in previous years had higher risk for HCV infection as a result of less stringent HCV infection control measures in the past [2,5]). In our study, HCV infection was more strongly associated with mortality in incident MHD patients with a dialysis vintage <6 mo when compared with prevalent MHD patients (see Figure 2 and Tables 3 and 4). This finding may be due to a survival bias among prevalent MHD patients, especially because the mortality rate is 21% per year (30). Hence, our estimates of HCV-associated mortality may be conservative (i.e., the true association between HCV infection and short-term risk for death in MHD patients may indeed be higher than that observed in prevalent cohorts). However, a cohort effect may also have led to these contrasts. Future studies are needed to examine these hypotheses. In our investigation, as in others, the EIA was assumed as the reference standard of the HCV infection, and HCV-positive status was assumed to hold both prospectively and retrospectively when at least one EIA test was positive. These assumptions may not be correct if seroconversion occurred during the cohort time. Indeed, in 48 (3%) patients of our cohort, discrepant results were noticed, indicating lack of certainty about HCV infection status. Furthermore, EIA testing may underestimate HCV prevalence in dialysis patients, some of whom may not develop anti-HCV antibody at least in early stages of HCV infection as a result of relative state of immune deficiency (20). Molecular-based assays that detect HCV RNA, such as PCR and transcription-mediated amplification, are somewhat more sensitive diagnostic tests and may pick up additional HCV-infected patients (20,31). Hence, it is likely that the true prevalence of the HCV infection in our population is higher than that detected by the EIA test; misclassification of a small proportion of EIA-negative but HCV-infected patients may have introduced some bias in our estimates, most likely toward the null. Our study indicated that HCV infection is more common among younger MHD patients, especially those from minority racial and ethnic backgrounds (Tables 1 and 2). More than half of HCV-infected patients in our study were black. In another observational study of dialysis patients who underwent renal transplantation, HCV infection was also found to be higher in black patients (3). These findings may be due to socioeconomic effects, rather than a direct effect of race, as reflected by higher prevalence of Medicaid insurance among HCV-positive patients. The association of HIV with HCV is perhaps not surprising, given that it shares some mechanisms of transmission with HCV, whereas the smoking association is of less clear origin. We observed a paradoxic reduced prevalence of cardiovascular disease in HCV-infected patients despite their higher mortality, including as a result of cardiovascular disease; this paradox may be due to the younger age and lower prevalence of diabetes in HCV-infected MHD patients. Additional studies are needed to confirm and explain these relationships. A key finding in our study was the higher short-term all-cause and cardiovascular mortality rate among virtually all subgroups of HCV-infected MHD patients (see Table 4 and Figure 3). 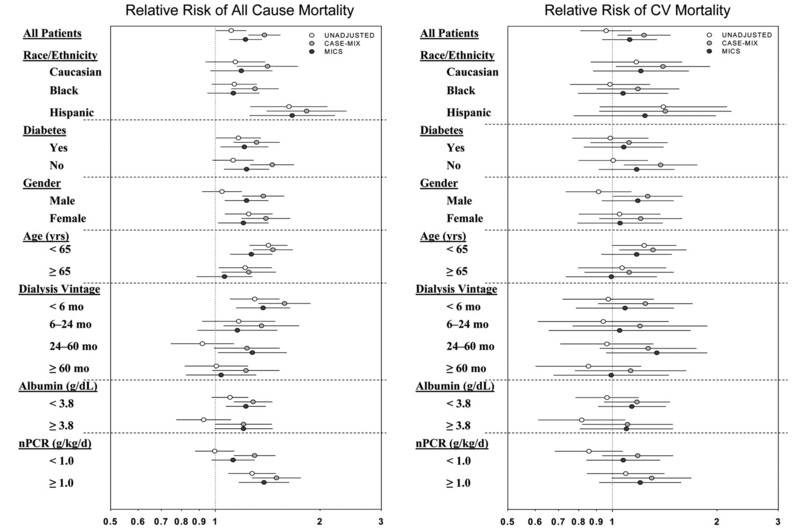 At least four other dialysis cohorts have exhibited an association of HCV with mortality (7–10), but all were of relatively limited size, and their findings may have not been applicable to the larger population of patients. Our original hypothesis that this association could be due to MICS in HCV-positive patients was only partially confirmed, because serum albumin, a surrogate of visceral protein, was lower, but TIBC and creatinine, other nutritional surrogates, were paradoxically higher in HCV-infected patients compared with HCV-negative individuals. However, direct markers of inflammation and MICS, such as proinflammatory cytokines, were not available in our cohort. After adjustment for 13 available surrogates of MICS, the association between HCV infection and mortality was reduced in some subpopulations, which may indicate that MICS is either a confounder or may be at least partially in the causal pathway (20,32). Hence, at least among some MHD patients, HCV may be associated with poor survival and higher short-term cardiovascular death through yet-to-be-determined factors such as MICS. Our study confirms some of the results that we recently reported from analyzing a limited number of patients of the same cohort (11). The latter study, however, included only 367 HCV-infected patients, was limited to the baseline calendar quarter and only 2 yr of follow-up, did not include time-dependent repeated measures, lacked information on history of comorbidity and smoking, and did not include subgroup analyses because of small sample size (11). A limitation of this study is potential misclassification of the cause of death as cardiovascular. Hence, all-cause death may be a more reliable outcome than cause-specific mortality. Another limitation of our analysis is that it is based on a 3-yr period of the cohort, rather than longitudinal follow-ups over many years. Nonetheless, our results indicate that even short-term all-cause and cause-specific mortality is high in HCV-infected MHD patients. More elaborate and sensitive HCV detection tests such as molecular tests (20) were not used in our study, because such methods are substantially more costly and usually not used as screening tests. However, all laboratory measurements are performed in one single facility, and most data are means of several measures. Hence, measurement variability is minimized. Despite reported reductions in the prevalence of HCV infection in dialysis populations in such countries as Spain (8), Italy (12), and Greece (33), which have had HCV prevalences much higher than those in the United States, the HCV infection rate among North American dialysis patients does not seem to have changed considerably. Regardless of its wide range of prevalence variation among various countries (29), the associations between HCV infection and increased death risk in dialysis patients seem consistent (7–12). Because dialysis patients have an exceptionally high short-term mortality, it is less likely that the HCV-associated death risk is due to such long-term HCV complications as liver disease. Inflammation associated with chronic infections (17–19) may contribute to the increased death risk in these individuals (20,32). The currently conservative approach to HCV-infected dialysis patients (not treating them unless they have active liver pathology) may need to be revisited in light of findings that link HCV infection to short-term death. More diligent efforts to prevent infection in dialysis clinics may be warranted. Our results may have implications not only in the management of HCV infection in dialysis patients but in many other individuals without renal failure. More studies are needed to verify the true prevalence of HCV infection in the 21st century among dialysis patients in various countries using newer molecular testing to understand better the natural course of HCV infection and its link to short-term mortality and to evaluate the effectiveness of current and future anti-HCV treatment modalities in improving clinical outcome in dialysis patients. This study was supported by grants from the philanthropist Harold Simmons, the American Heart Association (0655776Y), National Institute of Diabetes and Digestive and Kidney Diseases (DK61162), and DaVita (to K.K.-Z.) and the National Institute of Allergy and Infectious Diseases (AI01831 to L.G.M.). Some results were presented in abstract form during the annual conference of the National Kidney Foundation; April 19 to 22, 2006; Chicago, IL. K.K.-Z. contributed to the design of the study, collation and analysis of data, and writing of the manuscript and its revisions. R.D.K., L.G.M., and E.S.D. contributed to the analysis of the data and reviewed and approved the final manuscript. C.J.M., J.D.K., and S.G. contributed to the design of the study, provision of data, and final review and approval of the manuscript. Parts of these data were supplied by the USRDS, and the findings do not necessarily represent the opinion of the US government or the USRDS.